Its been a couple years since there has been a really good SPS pest identification and treatment thread. I know that there also have been a lot of advances in the way we treat our tanks and what we treat our tanks with. Our hobby also sees new people starting the hobby everyday while other people figure its time for a break. I can only speak for myself, but when I started adding corals to my tanks, I really did not properly QT corals and I ended up having to learn about pests, bugs, treatment and quarentine the hard way. There has been many threads in the past that have discussed topics, such as red bugs (rb), Montipora Eating nudibranchs (monti nudis) and Acropora Eating flatworms (aefw). A couple of my favorites are SPS PREADATORS Red bugs, AEFW's ,Monti nudis and Sea spiders. Pictures Inside and AEFW new info and photos . There are plenty more (search feature is amazing), but I thought it was time that we also revisit the topic and begin to get some new photos. Here are just a couple of my favorite shots from over the years. Please feel free to add you pictures and experiences. Last edited by mpoletti; 10/28/2009 at 04:35 PM. Chalices did this to me..
Good thread Mark. Was just looking through some of the old threads last night but most of them were from 2006-2007. It will be nice to get some recent updates since technology (and pest resistance) has changed over the past few years. Please check out my Reef Website! Current Tank Info: 246g Display, 39g Frag Tank, Sfiligoi XR6, Royal Exclusiv AC 300, 2 x MP60ES Vortech's, 2-part with LMIII, Apex. Thanks Craig. I too am always looking for new inforamation. We have come a long way in the last couple of years in the treatment of pests. Hopefully people will come together to share their experiences so we can help educate each other just a little bit more. There are many different ways to treat our tanks once our tanks are affected depending on the type of pest. The only way not to introduce any new pests into out tanks is not to add anymore coral We all know thats not going to happen so it is suggested to have a QT tank for all new incoming coral for a minimum of a month. It is the least you can do to help prevent any unwanted additions to your system. The month long duration will allow any eggs that are on the coral to hatch and begin their feeding; thus easier to spot. Another thing to remember is that just because your tank might be infested, it is not the end of the world. There are plenty of people that have moved beyond the days of worrying about pests to have successful reef tanks. There are also plenty of stunning tanks that just live with them in their systems. Many people use "the basting menthod" where they use a turkey baster or powerhead to blow the pests (especially aefw) off the corals. This methods helps to manage their numbers and allows the coral to continue to thrive. The basting method, along with natural predation (wrasses and such) does work and many say that they have not seen any evidence after a period of time. Some of my favorite tanks are still currently using this method. We going to make this one a sticky. Based on my observations and work described here, I suggest the following as a treatment protocol for Acropora colonies that have been colonized by the parasitic copepod, Tegastes acroporanus ("red bugs") as a modification of the novel protocol developed by Dorton. The process is more labor intensive, but should be more effective in preventing any future need to treat Tegastes-parasitized Acropora in the display tank (provided quarantine is utilized for any new coral acquisitions). It should also help to reduce the current epizootic within reef aquaria by limiting the potential for spread between tanks by trading or purchase of Tegastes-colonized fragments or colonies. 1. Assume that every Acropora in the tank is colonized, even if there are not visible copepods on the colony. rationale: copepods are cryptic on normally colored colonies, can be cryptic on pale colonies, and are small enough to be easily missed by examination through tank glass or even by direct observation with the naked eye. 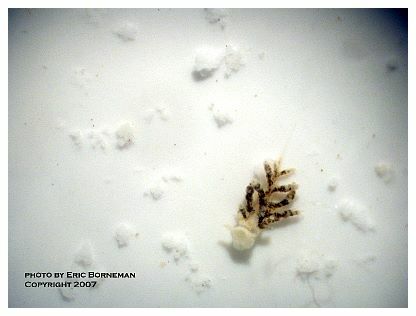 Furthermore, the copepods are motile, and swim between colonies. Therefore, any colonies removed for treatment may leave unnoticed indivuiduals on other colonies or allow for copepods that abandon hosts being removed for treatment to locate uncolonized Acropora. 2. All Acropora colonies should be removed from the tank and placed into a container for examination. This can be perfored one colony at a time. A magnifying glass, magnifying lamp, dissecting scope or some other method should be used to slowly and carefully examine each colony from every possible angle. The Corals will tolerate extended handling periods out of water to facilitate examination. The copepods will be covered with a smooth and somewhat shny carapace and with coral mucus and a thin film of water. Without examination from multiple light incidence angles, it is possible that individuals will go undetected. If a colony is too large or too densely branched to allow for a complete examination, consider it to be colonized. Any colonies that are determing to be free of copepods can be placed into a quarantine tank without treatment, but I would suggest reexamination prior to reintroduction to the main display tank. rationale: Examination by the naked eye is insuficient to detect all copepods. 3. All Acropora colonies found to have copepods present should be treated in a treatment tank or container where dose levels and colonies can be carefully monitored. The treatment tank can be large or small, and can be used to treat many colonies at once or one at a time. The water should be circulating strongly across colonies to not only for drug exposure but to help dislodge dead copepods. Following treatment, each colony should be re-examined in water under magnification to ensure 100% kill rates. Copepods still attached to the coral can be probed with a needle, pin, pipette or syringe and removed from the colony. If copepods are found to still exhibit any motion, retreatment should occur immediately. rationale: treatment in the tank should be avoided for several reasons: a) it will be impossible to assess whether or not a 100% kill rate has been achieved; b) in tank treatment will result in mass loss of other suscpetible species including amphipods, shrimps, lobsters, crabs, polychaetes, nematodes, copepods, and possibly other Invertebrates which have not been tested for toxicity to the drug ; and c) repeated treatments can result in resistance making future treatments more difficult. 4. Treatment dosage appears to flexible, if not variable. Given the apparent low toxicity to Corals even at elevated dosages, I would suggest a dose level equal or higher (up to 10x) than suggested by Dorton. Dorton suggestes three separate treatments of six hours. Upon examination of treated colonies, six hours appears to be insufficient for a 100% kill rate, while 12 hours seems to be more effective. In the one test where coral mortality was observed, the treatment time was only six hours, and in all other tests, no ill effects to the coral were seen with extended treatment times. It appears that time, and not dosage level, is the critical variable towards providing 100% kill rates for the copepods. Regardless of the dose or treatment duration, all colonies should be carefully examined before they are removed from treatment. For colonies being treated that are too large or densely branched to allow for examination, the treatment should be continued for 24 hours with careful monitoring to ensure that the colonies are enduring the treatment well and that the water does not become fouled from excessive mucus production, other fauna killed during treatment, or other stressors. If these conditions occur, treatment tank water should be dumped into buckets, sterilized by the addition of bleach to the water, and disposed down a sanitary sewage line. The treatment tank should then be refilled with tank water and new drug added to the water. 5. 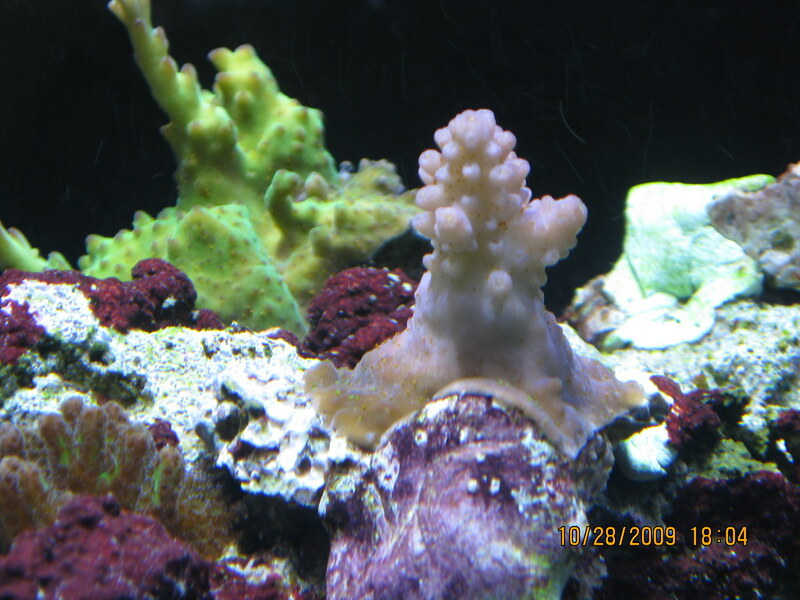 All treated Corals and completely free of Tegastes acroporanus, as well as those examined and found to be uncolonized (#2 above), should be placed into a quarantine tank filled with tank water filtered through a coffee filter or other filtration apparatus. The quarantine tank should have filtration, water flow and light sufficient to keep treated colonies alive for five days. 6. No Acropora should remain in or be placed back into the main display tank for five days. This is the longest period of time it has taken for any Tegastes acroporanus to survive without a host from observations to date. This assumes that there are no other surrogate hosts for this species, and that the observations of death from 3-5 days without a host are realistic of what would occur in a display tank. rationale: It is possible, even likely, that during the removal of colonized Acropora, some copepods swim off the colony into the tank. They will seek out other hosts. It is also possible that some are in the tank at any moment seeking new hosts, even without the process of colony removal. As far as can be ascertained, they are direct developers and thus do not have a free-swimming larval stage and they do not lay eggs on the host or substrates that can later hatch. However, they can live without a host for several days. Ensuring that any copepods left in the tank after removal of hosts die requires, at my best estimate, 3-5 days. I suggest five days to be conserative. 7. After five days, colonies in quarantine should be re-examined under magnification and if found to be free of copepods, can be returned to the display tank. If copepods are found on any colonies, repeat steps 3-7." Here are some old threads that I still look back at from time to time. Acro Eating Flatworms in a Bowl: Test Time! Acro FW's I got 'em, you treat 'em. While I agree that tanks still can flourish while infected with AEFW in combination with blowing off the flatworms every week, I always wonder how the corals would have developed without these worms constantly draining the corals energy to heal the existing coral tissue. Last edited by Tony B (UK); 10/29/2009 at 08:21 AM. Visit Tony B (UK)'s homepage! mpoletti, have you tried CoralRx for the SPS pests? No I have not. I have had good results with revive so I just stick with what I know that works. If I am a little untrusting of the coral and its source, I also might add in some Levamisole for some extra punch. I just found I have these but what are they exactly and how can I treat them ? They do appear to be the same. Here is the above post from Brian that might help. Please also remember Reef Central's stance on Interceptor. I do not want to get anyone in trouble. Yes I'm aware of that, and just in case, is it known an alternative treatment for these red bugs ? I blanked out on this one.